After much hard work, the project put together an academy with federal (Title V) funding. Each year the academy had a different focus. 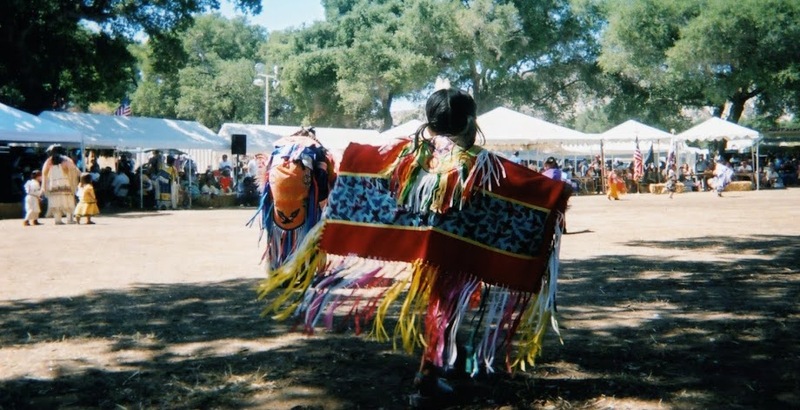 In 1997 the year’s final outcome was aimed at producing a modern-day recreation of a traditional Chumash tomol. The children and teenagers attending ranged from elementary through high school. Many are Chumash, but the kids represented a variety of tribes, all with a common bond: every one of these kid’s lives in an area that made up the traditional Chumash homeland. 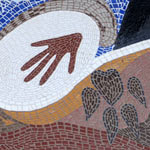 We all hold the culture, traditions, and history of the Chumash people in our hands and in our hearts. The tomol, a type of plank canoe, is unique to the Chumash. 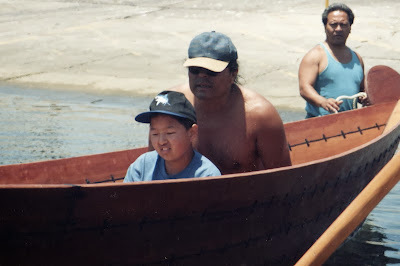 Tomols were used for trips between the islands and Chumash settlements. Originally they were about thirty feet long, and could hold four thousand pounds. Usually they carried six people but could hold up to twelve. Our modern-day tomol was built by the children under the guidance of Peter Howorth, in his backyard tomol building workshop. There is a perfect balance between master and apprentice as the children sand pieces of the vessel throughout construction. A dozen hands move slowly across the handle, moving towards the paddle end of an oar. Small hands, young hands, skin so smooth and maroon, peach-colored hands, muted brown, every child with a tribal memory circling her or his heart. A kind of palpable energy surrounds the tomol project. People seem to want to be a part of what’s going on. American Indian students from Cal Poly and UCLA arrive to volunteer support. Before I know it, I’m one of those helping out. The more I sand, the closer I am to the tomol. Sometimes I stop in the middle of the day and am silent in respect to the ancient peoples who left the witness of their lives, their visions, the strength of their faith for us to ponder. My son is one of those kids helping out. He knows about the pleasure found in working hard, and seeing the good results of that work. As he sands the pieces of wood I watch him find his relationship with the plank canoe he is helping to create. Our real goal is not only the finished tomol; it is also the season long process of working together. Still, everyone eagerly waits the day the vessel will be launched. When the maiden voyage takes place, within the harbor, there is only a small gathering of people. Before the “official” crewmembers begin their training we get to know the tomol. Her name is Alolkoy—dolphin in Chumash. She is twenty-five feet long, and made of redwood. Conditions in the harbor are ideal. The sun is warm; a soft, steady sea breeze blows at our backs. We fill sandbags for ballast, and then one at a time, we each have a turn sitting inside the tomol. Alolkoy is much lighter than I ever imagined. Slowly I become one with her. I only have to “think” of shifting my weight left, and she responds almost before I even move. By the end of the day I understand we should not take photographs while we are with her, not yet anyway. First I watch someone drop a camera into the ocean, and then the back of my camera opens, exposing my film. Remembrance weighs heavy on my mind, as it does for most Native people seeking to affirm cultural identity in a high-tech world. There is a comfort in being with those who understand. Our kids do not have to trade in their Indian values for education; the project carried ancient memory and cultural knowledge into their lives today. First Published in the winter 1997 issue of News from Native California. © Terra Trevor. A number of the children who participated in the Tomol backyard building workshop have grown up to become crewmembers making the crossings from the mainland to Limuw - Santa Cruz Island. You might also like to read the follow up story Tomol Evening by Terra Trevor reprinted from Volume 29, No. 2 (Winter 2015/16) of News from Native California.